Many throughout all generations have asked why does God allow suffering? Yet with technology today man has even more ways of helping his fellow man but does he? Jesus said we will always have the poor among us, and we still have underdeveloped countries and millionaires in our nation, we have the homeless on our streets still among us and millionaires in our nation. No it’s not up to millionaires to pay for everything IT IS UP TO EVERY ONE OF US to step up to the plate and see our brothers and sisters in need and take action! It has happened many times God is blamed, but is it not us who allow injustices in the land? For we are expected to uphold what is right. It is written the Lords hand is not shortened to help us, but it is our iniquities and sins that has caused God to hide His face from us. (Isaiah 59:1-9). Behold, the Lord’s hand is not shortened, that it cannot save; neither his ear heavy, that it cannot hear: But your iniquities have separated between you and your God, and your sins have hid his face from you, that he will not hear. For your hands are defiled with blood, and your fingers with iniquity; your lips have spoken lies, your tongue hath muttered perverseness. None calleth for justice, nor any pleadeth for truth: they trust in vanity, and speak lies; they conceive mischief, and bring forth iniquity. They hatch cockatrice’ eggs, and weave the spider’s web: he that eateth of their eggs dieth, and that which is crushed breaketh out into a viper. Their webs shall not become garments, neither shall they cover themselves with their works: their works are works of iniquity, and the act of violence is in their hands. Their feet run to evil, and they make haste to shed innocent blood: their thoughts are thoughts of iniquity; wasting and destruction are in their paths. The way of peace they know not; and there is no judgment in their goings: they have made them crooked paths: whosoever goeth therein shall not know peace. Therefore is judgment far from us, neither doth justice overtake us: we wait for light, but behold obscurity; for brightness, but we walk in darkness. We can complain till the cows come home yet it will not change what is truly important for any one of us to do which is serve Christ, and if God is blamed instead of sought out for answers to our problems we may not like the recompense. In proverbs we learn it is the righteous who are repaid more in the earth than the wicked and the sinner are. (Proverbs 11:31). Behold, the righteous shall be recompensed in the earth: much more the wicked and the sinner. From the very beginning God has given man free will, and when bad choices are made and repercussions come it is our actions and not Gods coming to pass. 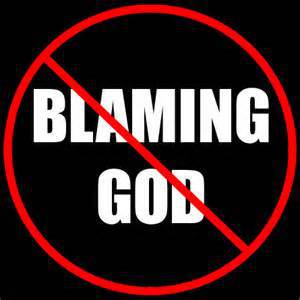 There is no blaming God who is Holy and Soverign, because there is NO counsel against Him. (Proverbs 21:30). There is no wisdom nor understanding nor counsel against the Lord.